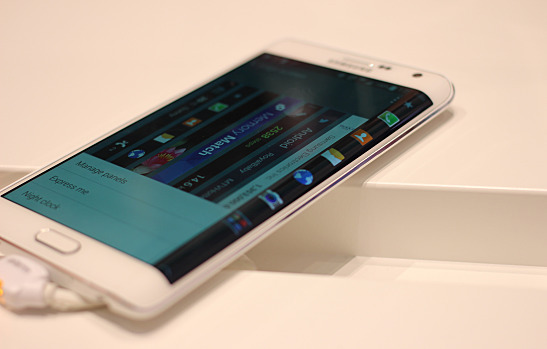 The Samsung Galaxy Note Edge is the first phone with a groundbreaking secondary screen running along its edge. The Samsung Galaxy Note 4, which was released last month, will ship about 11 million units in 2014, but the company will only be shipping one million units to a select batch of consumer markets. The Galaxy Note Edge phablet is classified as a “limited edition concept design” and Samsung will only ship one million units in 2014, Phone Arena reports. While one million may seem like a lot, preorders for the iPhone 6 in China alone numbered more than 20 million, according to CNET. While the device’s curved screen drew a lot of attention from industry insiders curious to discover what possibilities this space created, the limited edition release of the phone gave rise to some fairly interesting marketing campaigns. Samsung announced that it would only release the Samsung Galaxy Note Edge in Germany if 120,210 people voted for its release. The campaign for the unique, curved 5.6-inch Quad HD + Super AMOLED display ultimately succeeded. SamMobile reports that more than 130,000 votes were received within four days from eager German consumers. According to Phone Arena, the Galaxy Note Edge will be released in 25 countries across North America, Europe, Asia, and Australia, which is a fairly small area when considering that the Galaxy Note 4 is available in over 100 markets around the world. The device will be available in: Austria, France, Germany, Italy, Luxembourg, Netherlands, Denmark, Finland, Iceland, Norway, Sweden, Poland, Portugal, Spain, Switzerland, United Kingdom, Australia, India, Nepal, Singapore, Russia, and Kazakhstan. Because the phone has already been released in Japan and South Korea, and the U.S. release date is set for later this week, on Friday, Nov. 14, those three countries have been excluded from the list. Do you think Samsung should make the Note Edge a global release?